Alkaline–surfactant–polymer (ASP) flooding has developed into the important economical and effective technical method which has been verified that ASP flooding can enhance recovery ratio 10% compared to polymer drive, compares the water drive enhancement recovery ratio above 20%. Especially for upgrading old oil–gas field with high water-cut stage, the advantages of ASP flooding synergetic effect are more clearly compared with the previous solutions such as water driving, polymer, and surfactant flooding. There are over 83 × 108 tons of the reserves for ASP flooding which can be produced by injecting ASP solutions; there are over 14 × 108 tons of the reserves only for Daqing oil field that can be produced by injecting ASP solutions. ASP flooding is a research hot spot, difficult points and the leading edge of exploration and development of oil–gas field with great potential and broad prospects. This paper has introduced new developments, explained features and displacement mechanism of ASP-enhanced oil recovery (EOR), and analyzed the urgent key technical hurdles of ASP (EOR). Comprehensive compared challenges and corresponding solutions of ASP flooding (EOR) among domestic and foreign oil-gas field, we discussed the industrialization promotion prospects of ASP flooding (EOR). Copyright 2017, Shaanxi Petroleum Society. 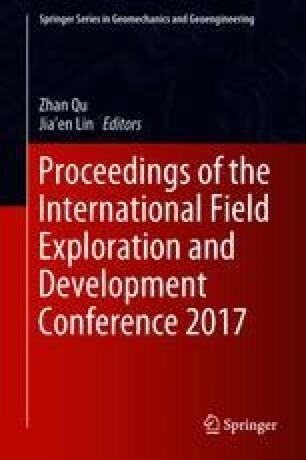 This paper was prepared for presentation at the 2017 International Field Exploration and Development Conference in Chengdu, China, 21–22 September 2017. This paper was selected for presentation by the IFEDC&IPPTC Committee following review of information contained in an abstract submitted by the author(s). Contents of the paper, as presented, have not been reviewed by the IFEDC&IPPTC Committee and are subject to correction by the author(s). The material does not necessarily reflect any position of the IFEDC&IPPTC Committee, its members. Papers presented at the Conference are subject to publication review by Professional Committee of Petroleum Engineering of Shaanxi Petroleum Society. Electronic reproduction, distribution, or storage of any part of this paper for commercial purposes without the written consent of Shaanxi Petroleum Society is prohibited. Permission to reproduce in print is restricted to an abstract of not more than 300 words; illustrations may not be copied. The abstract must contain conspicuous acknowledgment of IFEDC&IPPTC. Contact email: paper@ifedc.org or paper@ipptc.org. The research was supported by Major National Science and Technology Project (No. 2016ZX05054013), The National Nature Science Foundation of China (Project No. 41372208 and No. 40534019), and The Open Found of the State Key Laboratory of Ore Deposit Geochemistry, CAS (Project No. 201304).